At the beginning of the year there was wild speculation about the now presented LG G7 ThinQ. Would LG abandon the G Series? Did the developments made up to then even have a unique selling point? A new leadership team at LG is trying to turn the tide of the stumbling smartphone segment. Let's make an assessment of this apparent new beginning, embodied in the LG G7 ThinQ. Trips right off the tongue, doesn't it? 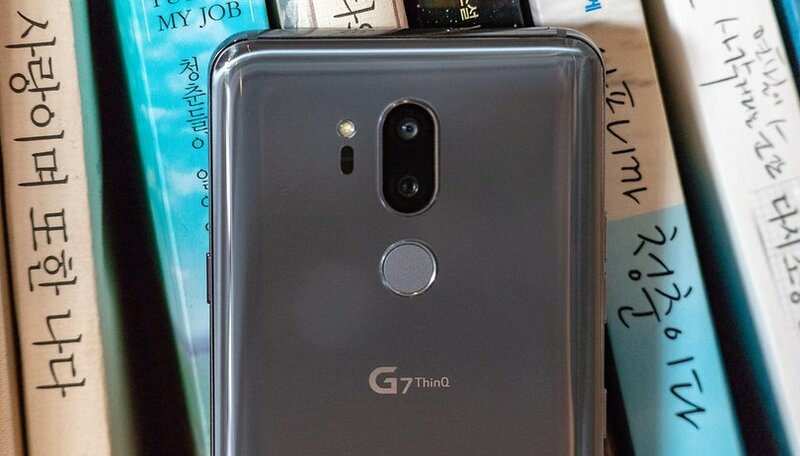 Honestly, it seems a bit forced to add the name ThinQ to the G7. Everyone should be aware that the LG G7 will probably be how the device is referred to in normal conversation. LG will know that too. So what's this strange-sounding suffix for? Sure, LG wants to bring its product range under one roof. But does that work with this carelessly tossed-out term ThinQ? Hardly. The goal must be to give the smartphone a character with the name. But the G Series has lost it, if it ever had one. The LG G Series itself is well known, but it stood for high-end, mainstream and IPS display (now in the seventh iteration). There is simply no concrete identity that is necessary for long-term success. ThinQ is an ingenious attempt to reconcile the different products. An all-in might have made more sense: There might have been an outcry if LG had actually deleted the G designation. As a new series of smartphones, ThinQ might have been a harder sell, but a real reboot would have been easier. With a little skill and dedication, the following sentence could perhaps be heard in stores: "I want the new ThinQ!" But as it stands, the ThinQ fizzles out thanks to the laziness of the speakers (or the clunkiness of the word). We have to take a quick look at Apple: With its iPhones, Apple stands for high-end smartphones worldwide. These are not cheap, of course, but Apple provides everything you need: hardware and software from a single source, updates and support. This image is more or less identical worldwide. LG, on the other hand, struggles with the fact that perception is different everywhere. Above all, there is a massive discrepancy between Korea and the rest of the world. In its home market, LG is doing quite well and achieves higher prices than anywhere else. The high-end V and G series smartphones also sell there. In Korea, the mobile division's figures are comparatively good, so it is no wonder that product developers are making strong decisions for the Korean market. Exaggeratedly, one could say that LG is pursuing a "Korea first" policy. Whether market launch, update supply or equipment variants: Korea always has an advantage over other markets and comes into play earlier or more extensively. This is understandable in view of the figures, but it causes a problem in other regions of the world: Why buy a slimmed-down G6 here? Why wait a month or two longer for the V30 or G7? Many smartphone manufacturers today have the problem that they design good smartphones. But only good ones. In view of the competitive pressure, however, this is not enough. Samsung and Apple may not do too much better than everyone else, but with huge real estate in the stores, they get a head start that hardly any other manufacturer with simply good smartphones can make up for. In the shop, it's the smartphone for which the seller receives the higher commission or which one he or she can sell fastest. Even with the best arguments, hardly any manufacturer can compete against the top dogs. Huawei has now made it and developed a strong store presence. LG is far from it, particularly since LG will hardly be willing to substantially increase the expenditures for marketing, although it would probably be worthwhile for the V30 and the G7: The few problems of the two smartphones would hardly stand in the way of a successful marketing campaign. All this leads to the big problem that LG has in many countries: Pricing. A V30 or G7 has high production costs, so LG has to start at a high price. However, prices often fall very quickly, so that LG smartphones are quite affordable just a few months after the market launch. Who wants to buy or recommend a smartphone that is $200 or $300 cheaper a few weeks later? In this country, LG's middle class is particularly successful, which is reflected in the average sales prices. In most regions of the world these are significantly lower than in Korea. Altogether LG sits between two worlds, somewhere between high-end and budget, where the competition is fierce on both ends and in the middle. Honor or OnePlus are perfect examples of this: Both want to offer inexpensive smartphones and are orienting their product development towards this goal. LG, on the other hand, is caught between the claim to high-end (largely realized in the V30 and G7) on the one hand and as value for money (but only a few months after the market launch) on the other. Will the LG G7 bring a turnaround for LG? It remains an exciting possibility. Will you consider the LG G7? If not, what do you think LG needs to change in the future? There is a lot of negativity surrounding LGs smartphones. I really don't understand why. The G6 is still a vastly underrated phone. The V30 quad DAC is fantastic, and the P-OLED display is actually quite good. complaints are way out of proportion. It seems like people like to hate LG smartphones just because they can. Marketing and weird local variations however is a disaster. I am really looking forward to the G7. LG'S mobile has been hurting for along time!